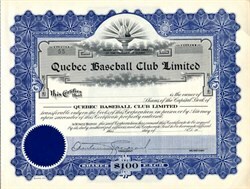 Beautiful partially certificate from the Quebec Baseball Club Limited printed in 1923. This historic document was printed by the Goes Company and has an ornate border around it with a vignette of an torch. This item has the signature of the Company’s President. The 1924 team played as the Quebec Bulldogs in the Vermont-Ontario-Quebec Baseball league The team played from 1923-1925 before disbanding.